Every once in a while, All Star Video Sports will be able to create a video for a very special player, group of players, or team. 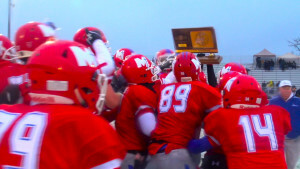 This past football season, that team was the Bishop Miege Stags football program out of Roeland Park, Kansas. We get to work with young men and women that ooze with great character. Character that is defined by a great work ethic, positive attitude, a passion for a sport, a love for his or her teammates, and a relentless drive to become a champion. Often, we find players and individuals that have many of these amazing qualities, and we see the fruits of their labor in whatever they set their mind to. 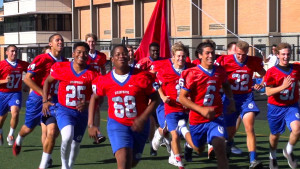 The Bishop Miege football team had this brand of character. We were able to follow and shoot HD video highlights for this team throughout the 2015 season, from the first day of pre-season bootcamp to the final snap in the 4A D1 State Title game (which they won). From day one, some of my colleagues and I recognized what a tight knit group this was, especially with this particular class of seniors. The team had won the state title the year previous, and from the beginning of the season, they believed they could do it again. By the time the State Championship Game was underway, I began to look back at how this team accomplished what they did, and what a great run it had been for the young men and coaching staff on the team. Getting to watch this team game in and game out through the camera, I began to realize this kind of comradery and bond between athletes does not happen very often. Among all of the things this team accomplished over the season, they definitely showed they were something special.